1. This picture of Chicago Christians who showed up at a gay pride parade to apologize for homophobia in the Church. … and the reaction from the parade. 2. This story about Japanese senior citizens who volunteered to tackle the nuclear crisis at Fukushima power station so that young people wouldn’t have to subject themselves to radiation. 3. This picture of two Norwegian guys rescuing a sheep from the ocean. 4. This sign at an awesome bookshop. 5. This poll about what Snooki should name her child. 6. The moment in which this Ohio athlete stopped to help an injured competitor across the finish line during a track meet. 17-year-old Meghan Vogel was in last place in the 3,200-meter run when she caught up to competitor Arden McMath, whose body was giving out. Instead of running past her to avoid the last-place finish, Vogel put McMath’s arm around her shoulders, carried her 30 meters, and then pushed her over the finish line before crossing it. 7. This exchange between a 3-year-old girl and a shopping center. 8. This note that was handed to a waiter along with a $20 bill by an elderly lady in his restaurant. 9. This sign at an awesome Subway restaurant. 10. This picture of a villager carrying stranded kittens to dry land during floods in Cuttack City, India. 11. This sign at an awesome drycleaner’s. Plaza Cleaners in Portland, OR, helped over 2,000 unemployed workers who couldn’t afford dry cleaning. The store’s owner estimated that it cost his company $32,000 dollars. 12. This photograph of a man giving his shoes to a homeless girl in Rio de Janeiro. 13. This picture of a firefighter administering oxygen to a cat rescued from a house fire. 15. This interaction between a Guatemalan girl and a tourist she just met. 16. This gesture from a neighbor. 17. These photos of two children collaborating to rescue a dog who had fallen into a ravine. 18. This note on a young family’s check. 19. This exchange between a protester and a soldier during a protest in Brazil. 20. These pictures of a man jumping into rough waters to rescue a stranger’s Shih Tzu in Melbourne. Sue Drummond was walking her beloved Shih Tzu, Bibi, on a pier in Melbourne, when a fierce gust of wind picked him up and hurled him into the rough waters of the bay. A passerby, Raden Soemawinata, who happened to be on the pier that day to scatter his grandmother’s ashes, wasted no time in stripping down and diving into the bay to rescue the animal. 21. And this photograph of two best friends on a swing. Is your resume boring or superhero style? Find out how to create a resume and cover letter that will get you called in for that coveted interview. If you’re like most people who answer this question, you’ve probably come up with a phrase or sentence to the effect of “an overview and summary of personal skills, interests, employment history, attributes and professional experience.” Sound about right? Now think about this: did your response relate in any way to the PURPOSE or function of a resume? Did it speak to what your resume is designed to do? The purpose of a resume is to ___________________________. If you answered honestly and thoroughly, you’ve probably recognized a few fundamental responses, like “help me land interviews” or “catch the attention of prospective employers” or “help me find a new job.” In other words, what your resume IS happens to be far less important than what your resume is designed to DO. Your resume is a sales letter. Yes, you read correctly. Your resume is a sales letter. The idea of marketing or promoting yourself may be a bit uncomfortable, but opinions and judgments aside, you are absolutely using your resume to sell yourself to prospective employers. It’s not a question. It’s fact. Marketing yourself effectively ensures that the value you can add is obvious and clearly defined for your audience. This encourages prospective employers to interview and hire you, and ultimately requires that they provide adequate compensation for your time and talent. Knowing what a resume truly is can be a huge advantage, which is why it’s important to bring up a point on ethics. You can think of it as the Guiding Principle of Resume Writing (because that sounds fancy), but it’s really just common sense and old-fashioned honesty. Guiding Principle: ALL information you present on your resume and throughout the hiring process must be truthful, factual and accurate. Always. Does that mean you’re stuck with whatever resume you’ve already got? Absolutely not! There are plenty of clever ways to polish and refine your content that fall well within the bounds of professional ethics and personal integrity. As it turns out, the rapidly accelerating pace of decision-making means effective positioning of facts and details is an absolute necessity. The key is learning how to creatively present your skills and experiences in a way that works with the resume-scanning tricks used by the people making decisions about you as a potential candidate. This is one of the driving forces behind the New Rules of Resume Writing. Resume readers have limited time and an almost unlimited number of candidates to review, and it’s a good idea to use this knowledge to your advantage. 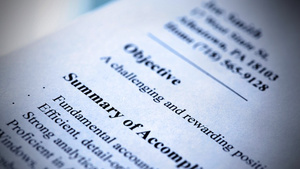 If you want to write a great resume, start by paying attention to the way employers describe their hiring goals in the job descriptions they write. Read as many of these as you can, paying particular attention to the words, phrases, and titles used by the people who are searching for individuals with your skills and experience. Understanding what they’re looking for and using the right language on your resume will help you attract more viewers, more interest, and more interview activity. You’ve heard the saying “you never get a second chance to make a first impression.” It’s as true in resume writing as it is in dating. One glance often sets the tone for an entire first date, and that same infinitesimally small opening is what you can reasonably expect from a resume reader. That means you have to get right to the point and show them something relevant, and do so without a lot of preamble and wasted space. As one of my mentors used to say, “treat the beginning of your resume like the front page of a newspaper and make sure it JUMPS out at readers.” The advice is even more relevant today than ever before. The rest of the rules require a bit more depth of explanation than can be offered here, but all point to a common theme – making sure others can readily find and identify you as a viable match for their opportunities. The internet empowers you to promote yourself to a far broader audience than has ever been possible before; understanding the rules of the game will help set you up for a far more productive and rewarding job search, and that’s a beautiful thing. Michael B. Junge is the author of Purple Squirrel: Stand Out, Land Interviews, and Master the Modern Job Market and a member of the leadership recruiting team at Google, Inc. He can be visited online at www.michaelbjunge.com, Facebook, and Twitter. Photo by Vartanov Anatoly (Shutterstock). CHOW.com’s Blake Smith shows how the simple technique of cutting a spiral pattern into your hot dog before grilling it will not only improve the wiener-eating experience, but will also transform the dog into a conversation starter. CHOW Tips are the shared wisdom of our community. If you’ve figured out some piece of food, drink, or cooking wisdom that you’d like to share on video (and you can be in San Francisco), email Jenny Stewart and tell us what you’ve got in mind.